We hope you are well and had a great weekend. This week we have a deal perfect for a child of the 80s. We're offering a free Retro Games Controller after cashback for new TopCashback members. The controller is compact and portable making it easy to connect to your TV and even includes 200 free games! As always, it would be awesome if you could promote us. Please see below for more details. Free Retro Games Controller after Cashback! All new members have to do to claim Free Retro Games Controller is follow these four easy steps! 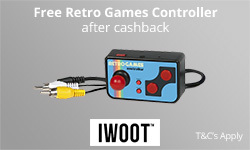 New members click 'Get Cashback Now' to go through to the IWOOT website and purchase their Retro Games Controller as they normally would. New members can enjoy a collection of 80's games knowing they'll be receiving up to £10 Cashback.